Walking through the ground floor museum, there’s a stale dank smell, known as the “East German” smell. The secret cameras, the recording devices. This is where Stasi employees worked, where people were kept in Stasi prisons below. No expense was spared to monitor and collect the sights, sounds, and scents of the East German people: what they said; what, how, and where they went about their daily lives. Blood, sweat and tears, for very different reasons. In Leipzig, Germany, the building that’s known as the Round Corner sounds innocuous. 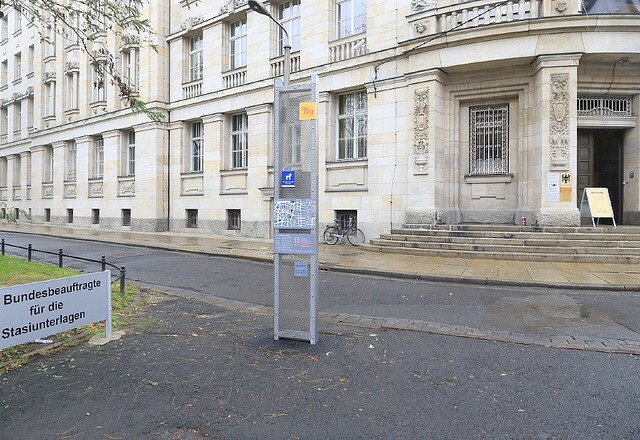 For many, the “Runde Ecke” is synonymous with the secret police or Stasi, short for “Staatssicherheit,” representing East Germany’s Ministry of State Security. In the early 20th-century, the building housed the headquarters to the Alten Leipziger Feuerversicherung fire-insurance company. The building was rumoured to have housed Nazi Gestapo during the Second World War, before American occupation forces moved in for a short time in 1945. The Soviet military moved in shortly thereafter, followed by the Soviet NKVD secret service and K5, predecessor to the Stasi. 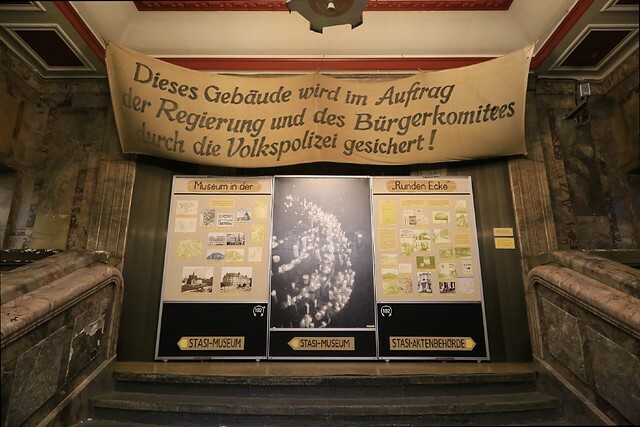 With the establishment of the East German State Security in 1950, the building housed the local district Stasi headquarters until 1989. 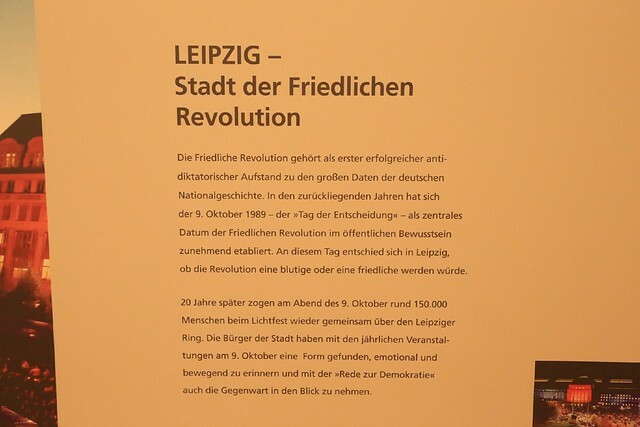 1989 is significant for the building’s historical importance to both Leipzig and Germany, and key to the story of that year’s “peaceful revolution”. The “day of decision” and non-violent demonstrations on 9 October 1989 led to the downfall of the local government. Weeks of Monday demonstrations made the building a focal point for anger and outrage. Much still needed addressing after the fall of the Wall on 9 November 1989. 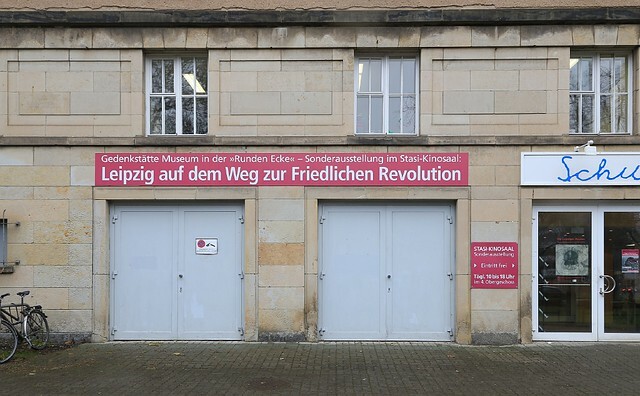 On 4 December 1989, protestors outside the Stasi headquarters demanded access to their files, eventually storming and taking over the building, and saving countless files from destruction. 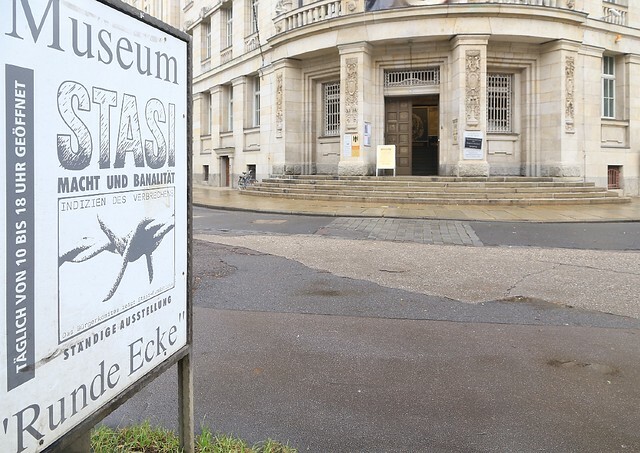 The Runde Ecke is now home to a museum to preserve knowledge about the activities of the Stasi, and is also home to a branch office of the Federal Commissioner for Stasi Files (BStU) to ensure files are properly archived and available for research, and to ensure files remain accessible for inspection to anyone who inquires. This building housed the district administration offices of the Ministry for State Security between 1950 and 1989. 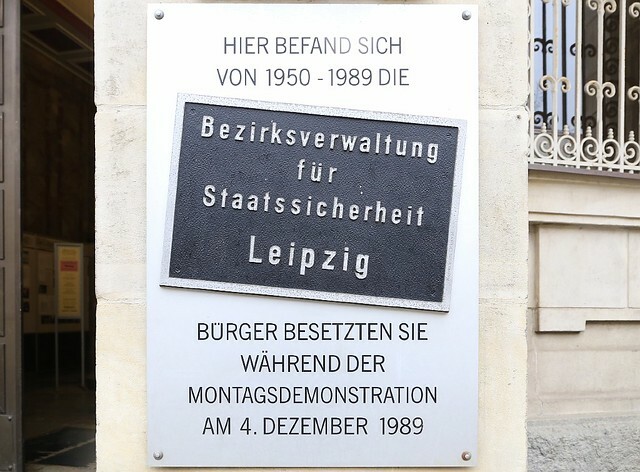 During the Monday Demonstrations, protestors arrived and subsequently occupied the building on 4 December 1989. 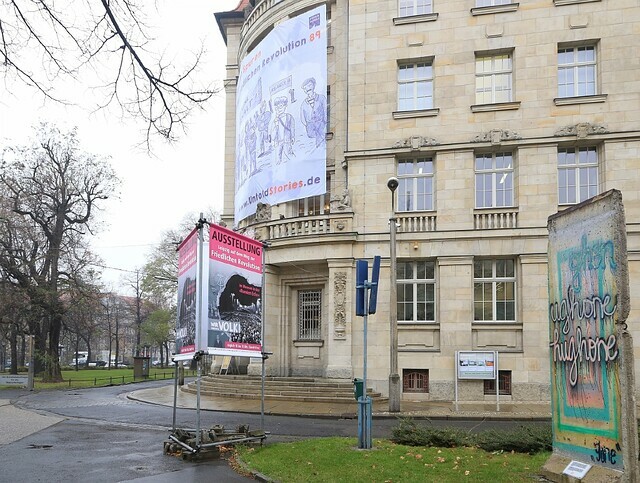 Building atirum: “This building is secured by the People’s Police on behalf of the government and citizen committees!” To the left is the Stasi Museum; to the right is the Stasi-Aktienbehörde, the public authority responsible for Stasi files. Open daily between 10am and 6pm, there is no charge to enter the Stasi museum in the Runde Ecke; most of the exhibition descriptions are in German. Photography is not allowed within the museum. 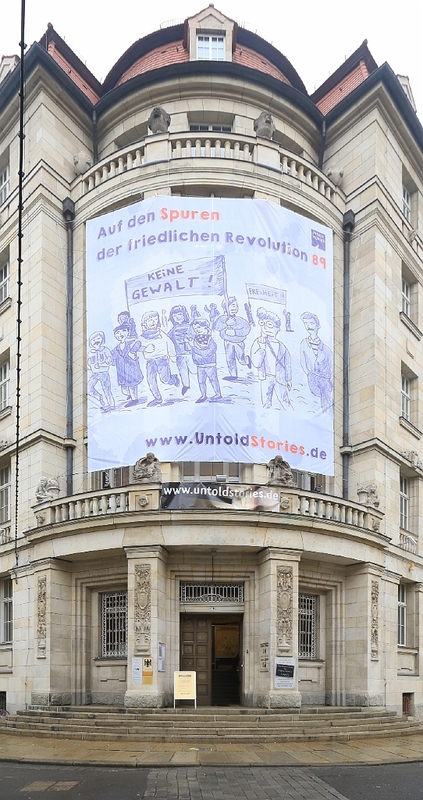 >I made the photos above on 4 December 2014, the 25th anniversary of the peaceful takeover of Runde Ecke. Thanks to Leipzig Tourismus und Marketing GmbH (LTM) and InterCityHotel Leipzig for their hospitality. Access to public transport was kindly provided by LTM and the MDV Mitteldeutscher Verkehrsverbund regional transport authority. This post appears on Fotoeins Fotopress at fotoeins.com at http://wp.me/p1BIdT-6p4.